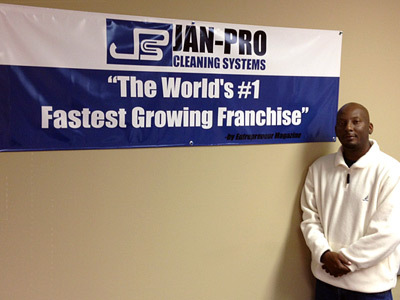 Q: Why did you open a JAN-PRO franchise? A: I wanted to be in business for myself and I heard great things about JAN-PRO. I like cleaning and it’s a great industry. I looked at some other franchises but liked the family atmosphere at JAN-PRO. Q: Is JAN-PRO in Alabama owned by a local family? A: Yes, Dominic Gentile is the owner and he has been in Alabama for a long time. He even played football at UA. We consider each other extended family, and therefore we support each other in good times and bad. Q: Did you start part time? A: Yes, I was part time for a couple of years, and now I run my business full time. It’s a great feeling of freedom. Q: How successful is your business? A: It’s great. I currently have 23 customers that I service. Q: What kinds of customers do you have? A: It’s a real variety ranging from general offices to medical buildings to real estate offices to telecommunications companies and everything in between. Q: What is the most difficult part of being a business owner? A: Owning a company is a great responsibility. Your success is dependent only on you and nobody else. So there is a certain degree of pressure that I put on myself. But that is just how successful people are. You need to have high standards to make it in any business, and this one is no different. Q: What kind of people make the best franchisees? A: People who are willing to learn and follow the JAN-PRO model. You also need to be enthusiastic and passionate, and respect your customers and associates. The customer always comes first.